Pennsylvania’s buzzing metro areas and scenic natural landscapes offer a wealth of career opportunities for those interested in a criminal justice career. Legal and protective services professionals are in high demand in metro areas including Philadelphia Pittsburgh, in cities with college campuses, at state parks, in high-traffic tourist and entertainment destinations, and in the capital city of Harrisburg. This page provides resources for students or graduates who are interested in pursuing a career in the criminal justice field in Pennsylvania. After Criminal Justice School in Pennsylvania: What's Next? Exploring different educational opportunities and criminal justice schools in Pennsylvania can take some time. It’s important to review degree programs, training options and tuition rates to make the most informed decision. Use the ranking list below to narrow down the wealth of options in this state and compare schools by acceptance rate, enrollment and more. Career pathways that align with the criminal justice associate's degree at Harrisburg Area Community College see adults serve in organizations like police units, juvenile justice departments, probations offices, correctional facilities and private investigation units. The college has transfer agreements with more than eight area four-year schools. In addition to its Harrisburg campus, the program is taught at the school's Gettysburg, York and Lancaster, Pennsylvania campuses. There is also an online degree option. Classes begin during fall, spring and summer. Applications are accepted online. It is important that prospective students have a vested interested in serving in the criminal justice field. Bucks County Community College is nestled in Newtown, Pennsylvania, a small suburb about 25 miles North of Center City Philadelphia. Many students at the college come from towns like Bristol, Levittown, Philadelphia and Bensalem. To earn an Associate of Arts in Criminal Justice, students must pass 60 credits. Instructors in the major include police officers and defense attorneys. Criminal justice majors at the college can plan on taking classes like law enforcement officer psychology, terrorism and constitutional law. Through the college's transfer agreement with Temple University, people who graduate with the associate degree and earn at least a 2.0 GPA can enroll in Temple's four-year criminal justice program. Classes in the Lehigh Carbon Community College Associate of Arts Criminal Justice Administration program are delivered on a semester basis. At the start of the first semester, students are generally introduced to the criminal justice system. Later in the training, students are generally educated on topics like law enforcement and society, criminology and ethics. Criteria for graduation is not met until students complete between 62 to 64 credits. Dual enrollment in concentrations like social work, human services, psychology or public administration could give criminal justice majors deeper understanding of human behavior and more tools to use to engage communities. After completing the associate in criminal justice degree at Butler County Community College, students should have the skills to understand how adult and juvenile criminal courts operate. Graduates will also be able to explain law enforcement theories, know the focus of major various law enforcement agencies and possess the skills to communicate effectively with diverse communities. Associate of Arts in Criminal Justice majors need 62 or more credits to graduate. Each of the program's fall, spring and summer semesters has a registration deadline. Final exam schedules are based on the date that classes start. Westmoreland County Community College offers three criminal justice degrees. There is an Associate of Applied Science in Criminal Justice, an Associate of Arts in Criminal Justice and an Associate of Applied Science in Homeland Security. Purpose of the homeland security program is to prepare first responders for local and national emergencies. It is through the criminal justice programs that adults learn how to manage community based criminal issues, including thefts, arson, homicides and felonies. Admissions applications and class registrations are completed online. Transfers into four-year programs are handled in partnership with the Pennsylvania Transfer and Articulation Oversight Committee. Students seeking a career in criminal justice can obtain a bachelor's degree from the ACJS certified program at Penn State University. The program curriculum is comprised of both theory and hands-on experience, and an option for 100 percent online completion is available. A minor in Homeland Security offers an additional complement to the program to diversify career opportunities. The Penn State World Campus is the online community for distance learners and offers academic advising and technical support as additional resource for busy students completing a degree in the online capacity. Online degree programs are asynchronous and thus can be completed at the student's chosen pace. The Department of Criminology & Justice Studies at Drexel University offers several degree program options for students, including on-campus programs, as well as a fully online option which can be completed on a self-paced timeline. In addition, the department provides the option of an accelerated degree program to complete a combined bachelor's and juris doctor in one year less than traditional programs. The criminology & justice Studies program curriculum combines theory and analysis with practical experience to provide a comprehensive knowledge of criminal behavior; a minor in computer crime provides opportunities for cutting-edge career paths within the field. The criminal justice discipline at La Salle University provides a diverse range of majors and minors to prepare students for career options within the criminal justice field. The curriculum in centered on incorporating theoretical knowledge with practical experience, including internship opportunities, and highlights the connections to social justice and social service. The student Criminal Justice Association offers membership to all CJ majors and facilitates events and guest speakers to provide additional knowledge and collaboration with others in the program. Academic guidance and peer tutoring are learning resources offered to all students to guide study practices and improve basic skills. Bachelor's and master's degree options are available through the criminal justice program at Gannon University. The undergraduate criminal justice degree curriculum utilizes an interdisciplinary approach to foster critical analysis and provide practical application of knowledge. Hands-on industry experience is encouraged through resources such as internship placements and the Forensic Investigation Center, in addition to opportunities for training with local agencies such as the police academy. The graduate program offered in criminalistics is designed to be completed by taking one course at a time and offers rolling admission, with an estimated completion time of one year, following completion of the undergraduate program. Preparing students for multiple career paths within the field of criminal justice, the Cedar Crest College criminal justice major focuses on honing leadership skills through community-based opportunities. In addition, the program offers flexible class schedules including evening, weekend, and online courses facilitate degree completion for busy students. With course requisites from various academic fields such as psychology, social work, and sociology, students are exposed to an interdisciplinary approach to combine theoretical knowledge with field application. Possible professional paths include homeland security, public safety, probation services, mental health services, and a range of additional choices within the field. When searching for information about careers in investigative services, juvenile corrections, law, or protective services, it’s important to review training and education information to determine which schools can provide adequate training. Many protective services jobs require academy training or training at a private facility. 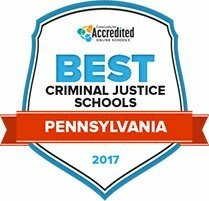 Use the tool below to compare criminal justice schools in Pennsylvania based on majors, tuition and degree programs. Fighting crime and protecting Pennsylvania residents requires a certain level of training and dedicated efforts by law enforcement officials, probation officers, lawyers, judges, and other legal and protective services professionals. Some career paths require completing a certificate program while others may require an advanced degree. Use the tool below to compare attractive criminal justice careers in Pennsylvania. From Philadelphia to Lancaster, Pennsylvania’s major cities have an ongoing demand for government workers, legal professionals and protective service officers. District courthouses, correctional facilities and private investigation firms are a few places to explore job opportunities after completing a training or degree program. The table below highlights the different criminal justice career options compared to national averages. Philadelphia, Pittsburg and Eerie boast the highest homicide rates in Pennsylvania, according to the latest reports from Keystone Crossroads. Demand for law enforcement officers, private investigators and security guards may be higher in these cities, opening a large selection of job opportunities. The Pennsylvania Department of Corrections or the Pennsylvania State Police Department may be a few places to start the job hunt. Below, find highlights of the largest areas of employment and wages for legal and protective services professionals across the state. Dr. Eileen M. Ahlin is an Assistant Professor of Criminal Justice in the School of Public Affairs at Penn State Harrisburg. Dr. Ahlin earned her PhD in Criminology and Criminal Justice from the University of Maryland, College Park. Her research and teaching interests include corrections, violence, neighborhood effects, and criminological theory. Her research has been published in journals such as Youth Violence and Juvenile Justice, Journal of Youth and Adolescence, Journal of Community Psychology, Journal of Interpersonal Violence, Journal of Experimental Criminology, and American Journal of Public Health. Some students may be interested in a criminal justice career because they are fans of shows like “CSI” and “Law & Order.” What would you tell those prospective students about the realities of the criminal justice field? AJust as we've seen a CSI effect among jurors who expect quick sophisticated DNA-type evidence in every case, there is a bit of a crime show effect on some prospective students who are interested in the criminal justice field. While many aspects of work within the criminal justice field mirrors what is seen on television, they must remember that the pace of action can be much slower in real-life than reflected in a one-hour show and not every crime is solved. However, there is quite a bit of opportunity to do good in the community that is not as frequently depicted on television that often surprises students new to the field. AStudents can expect to take courses that will introduce them to the core elements of the criminal justice system, including policing, courts, and corrections. Depending on their program, they may be required to take research methods courses, statistics and other math classes, and electives that deepen their understanding of different aspects of the field such as juvenile delinquency, victimology, and drug use. AStudents who are curious, critical thinkers with a desire to make the community a better place by serving citizens in various capacities (such as probation officer, social worker, police officer, corrections guard) make stellar criminal justice practitioners. Many criminal justice programs are also preparing students to be successful in graduate school for those seeking to earn a master's or doctoral degree in criminal justice or a related field or pursue law school. What makes the criminal justice profession unique in Pennsylvania? AOne unique aspect of Pennsylvania in the realm of criminal justice, particularly in terms of policing, is its governance structure. Much discretion is left to the local municipalities (e.g., townships, boroughs, cities), many of which are small. This means that much of the decision-making on community safety related issues reflects local interests, while also resulting in a large number of small municipality police departments that often need to interact and cooperate with the larger departments such as the Pennsylvania State Police (PSP), Pittsburgh and Philadelphia Police Departments, and local Sheriffs' Offices which may hold competing priorities. Also, much of Pennsylvania is suburban and rural, rather than urban. This impacts not only the terrain, much of which is mountainous and situated away from large urban areas and cities, but it can also affect interactions between correctional officers (most of whom are rural residents) and inmates (many are from urban areas, such as Philadelphia and Pittsburgh). Such demographic differences can add stress to an already difficult job. This section of the site features information for small business owners, including the by-laws and latest meeting details. It outlines important safety standards, waste management protocol and air quality rules to keep residents of Pennsylvania safe. This organization provides resources for small business owners, mentoring opportunities, and volunteer positions. It also includes information about compliance issues relevant to small business owners throughout the state. This organization provides services and resources for business owners looking to start or expand their business. Includes a list of upcoming events, centers and essential resources for startups. Founded to create a voice for business, the PA Chamber provides advocacy for its members so that they feel represented on the political stage. It also offers resources to support innovation and growth for businesses. The mission of the Pennsylvania DCED is to help businesses grow and succeed by providing connections and resources for entrepreneurs. The ACC is a membership-based organization that supports professionals in the corporate law profession. This section of the Pennsylvania Department of Corrections website features employment opportunities for those who want to work in one of the state’s correctional institutions. It also lists internships for undergraduates and internships for those looking to satisfy their postdoctoral internship requirements. This organization brings together state corrections officers and other professionals working in protective services. The website features member information, benefits, resources, and contracts. Managed by the City of Philadelphia, this organization work to promote programs offered to inmates and manages resources for inmates. The website includes information for visitors, latest updates and inmate location services. This association promotes best practices and professional standards for officers who work with juveniles and adults who are under community supervision. This page provides a directory of prison justice and advocacy groups based in Philadelphia. The website for Pennsylvania’s Unified Judicial System includes public access records, docket sheets, and information about cases of public interest. It also has a careers section with latest listings for deputy court administrator, district court administrator and similar jobs. This organization is dedicated to balanced and restorative justice by serving juvenile offenders, victims, and the community at large. The website includes a listing of the latest cases, leadership, and upcoming events. This organization serves as a trial lawyer association to protect citizens’ rights and provide its members with access to valuable resources. The website includes membership information, upcoming events, and information about legislative advocacy. The PCRA offers networking and professionals resources to its members. This government site provides information about how to use the state’s alternative dispute resolution program. Pennsylvania CASA is a statewide non-profit whose mission is to advocate for neglected and abused children the in the Pennsylvania court system with the end goal of securing a safe, permanent home for them. The ACLU of Pennsylvania is dedicated to defending citizens’ liberties. The website features the latest news, an area to submit legal complaints, resources explaining your rights, and job openings. This organization is responsible for administering Pennsylvania’s merit system for dozens of state agency that empty 57,000 civil service employees. This section of the website includes online resources for those who want to submit an application. Designed to provide leadership, funding and support to improve the quality and availability of civil legal aid for low income residents and victims of domestic violence, this organization is the place to offer pro bono services as a legal professional and find provider resources. The PBA is a membership-based group that connects lawyers around the state, providing them with professional resources and opportunities to network. This government page is a directory of organizations that help low-income Pennsylvanians find affordable legal assistance. The office of the Attorney General webpage provides public information about legal protection for consumers, criminal prosecutions, cases involving police officers and more in the state of Pennsylvania. A nonpartisan, non-profit organization, this group provides resources to state paralegals in the form of networking, professional standards and communication about developments in the industry. Those looking for employment with the Pennsylvania State Police Department can explore available opportunities on this website. Listings include opportunities for state troopers, liquor enforcement officers, police communications operators and forensic specialists. Police officers looking for training programs to advance in their careers can explore training programs from the Pennsylvania Chief of Police. The training network includes resources out those who want information about certification, special programs, and the curriculum. This organization provides resources and support for law enforcement professionals in Pennsylvania. The website includes details about training programs and upcoming events, executive board information and jobs opportunities. The PSTA serves Pennsylvania state troopers by providing professional resources and opportunities to connect with other state troopers. This organization is dedicated to protecting Pennsylvania’s air, land and water from toxic waste and pollution. The website serves as a resource center with information about upcoming events, the latest news, and data and tools. Individuals looking for information about state parks and forests, conservation efforts and grants will find a wealth of resources on this website. The DNC also hires for civil service and non-civil service jobs and maintains up-to-date listings on its website. This government page provides information about how to become a wildlife conservation officer, as well as guides to the application and training process. This organization is dedicated to educating Pennsylvanians about the environment and inspiring residents to protect and conserve resources. The organization serves as the educational arm of the Pennsylvania Federation of Sportsmen’s Clubs and the website features information about upcoming projects. The Bureau of Forestry works to investigate the causes of wildfires. This page provides information about getting involved with forestry enforcement efforts.